WASHINGTON -- Leading his first commemoration of the solemn 9/11 anniversary, President Donald Trump said Monday that "the living, breathing soul of America wept with grief" for each of the nearly 3,000 lives that were lost on that day 16 years ago. Addressing an audience at the Pentagon, one of three sites attacked on Sept. 11, 2001, Trump used the anniversary to warn terrorists that "America cannot be intimidated." He said those who try are destined to join "the long list of vanquished enemies who dared to test our mettle." 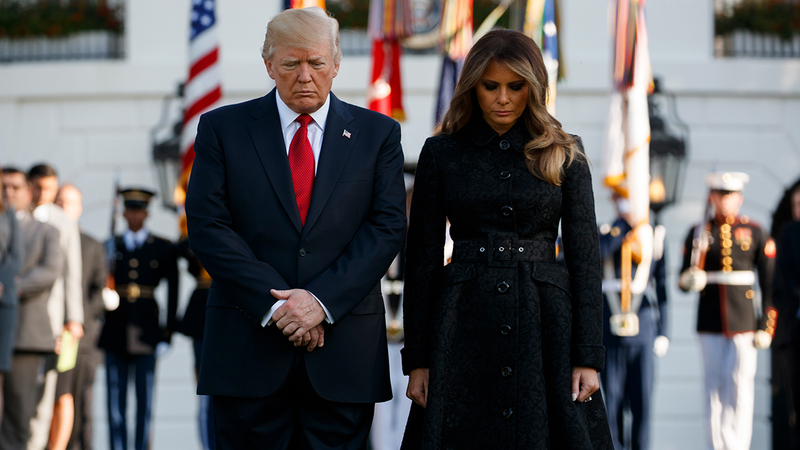 Trump and first lady Melania Trump observed a moment of silence at the White House on Monday at the exact moment that a hijacked airplane was slammed into the World Trade Center. The Trumps bowed their heads and placed their hands over their hearts as "Taps" rang out across the South Lawn. They were surrounded by White House aides and other administration officials in what has become an annual day of remembrance. Nearly 3,000 people were killed when al-Qaida hijackers flew commercial airplanes into New York's World Trade Center, the Pentagon and a field near Shanksville, Pennsylvania. Trump, a native New Yorker who was in the city on 9/11, said the attack was worse than the Japanese assault on Pearl Harbor during World War II because it targeted civilians, "innocent men, women, and children whose lives were taken so needlessly." He vowed that such an attack would never be repeated. "The terrorists who attacked us thought they could incite fear and weaken our spirit," Trump said later at the Pentagon, where he was joined at a 9/11 observance by Defense Secretary Jim Mattis and Gen. Joseph Dunford, chairman of the Joint Chiefs of Staff. "But America cannot be intimidated, and those who try will join a long list of vanquished enemies who dared test our mettle." He said that when America is united "no force on earth can break us apart." Trump also offered words of comfort to the many whose loved ones perished in the attacks. "For the families with us on this anniversary, we know that not a single day goes by when you don't think about the loved one stolen from your life. Today, our entire nation grieves with you," Trump said. Later, he said "the living, breathing soul of America wept with grief for every life taken" on 9/11. Vice President Mike Pence told an audience gathered at a 9/11 memorial in Shanksville that the passengers aboard the plane that crashed there may have saved his life. He recalled being in Congress and learning that the Capitol was a possible target of the hijacked plane, which was 12 minutes out. Passengers aboard the flight - it left a New Jersey airport with San Francisco as its final destination - revolted against their hijackers, who ended up crashing the plane in the field. Pence said "it was the longest 12 minutes of my life." "I will always believe that I, and many others in our nation's capital, were able to go home that day to hug our families because of the courage and selflessness of the heroes of Flight 93," Pence said. Trump has a checkered history with 9/11. He frequently uses the attack to praise the city's response after the attack, but has made unsubstantiated claims about what he did and saw on that day. Trump often lauds the bravery of New York police officers, firefighters and other emergency responders who rushed to the Twin Towers to help as an example of the resilience of the city where he made a name for himself. But he has also criticized President George W. Bush's handling of the attacks, accusing Bush of failing in his duty to keep Americans safe. Trump has made dubious claims about Sept. 11, particularly saying when talking about Muslims that "thousands of people were cheering" in Jersey City, New Jersey, across the Hudson River from lower Manhattan, as the towers collapsed. There is no evidence in news archives of mass celebrations there by Muslims. Trump also said he lost "hundreds of friends" and that he helped clear rubble after the attacks. Trump has not provided the names of those he knew who perished in the attack, but has mentioned knowing a Roman Catholic priest who died while serving as a chaplain to the city fire department.